Every teacher will encounter students with disruptive behaviour ­– it is one of the major causes of classroom conflict and teacher burnout. Although it is difficult to form successful relationships with students when interactions frequently involve reprimands and disciplinary action, some teachers do experience close relationships with disruptive students. Our latest research, published in Teachers and Teaching, helps to explain why. We now know that the student-teacher relationship is one of the most powerful forces in education; predicting a host of positive student outcomes and protecting against negative consequences, including peer rejection and risky behaviour (McGrath & Van Bergen, 2015). While close student-teacher relationships are remarkably important in all years of schooling, this is particularly so in the first three years of school. Students who experience close relationships with teachers in these years are likely to experience positive social, behavioural and academic outcomes throughout schooling. There are benefits for teachers too. Close relationships with students can protect against teacher burnout and promote wellbeing, whilst having a positive impact on the classroom climate more broadly. Students who behave disruptively, however, are less likely to experience close relationships with teachers. Because disruptive students are particularly challenging, teachers are more likely to report feeling ineffective when interacting with those students – discouraging them from trying to connect with them. Figure 1. Image adapted from a drawing provided by a disruptive boy in Kindergarten. See McGrath, Van Bergen & Sweller, 2017. For students who behave disruptively, a close relationship with a teacher can be particularly powerful; reducing aggression, improving prosocial behaviour, and protecting against the possibility of referral to special education settings. Until recently, little was known about how or why some teachers experience close relationships with disruptive students, and others do not. In our recent research, therefore, we sought to better understand how teachers build close relationships with disruptive students. Our sample included 29 classroom teachers, 18 support teachers, and 51 primary school students enrolled in Kindergarten and Year 1 (McGrath & Van Bergen, 2017). Students attended one of three schools in Sydney, in socioeconomically different areas (advantaged, average, and disadvantaged). Using a speech sample task, we investigated the emotional and relational qualities of teachers’ relationships with their students. 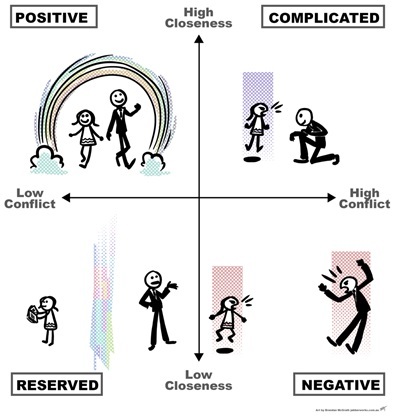 Student-teacher relationships are typically characterised by variations in closeness and conflict. Using these characteristics, we recognised four types of relationships between teachers and students: positive relationships, negative relationships, reserved relationships, and complicated relationships (McGrath & Van Bergen, 2019). Figure 2. Four types of student-teacher relationships. Adapted from McGrath & Van Bergen, 2019. To better understand why some teachers experience close relationships with disruptive students, we focused specifically on ‘complicated’ relationships (high in closeness and conflict) with students in Kindergarten and Year 1. We identified eight disruptive students from our original sample, with whom some teachers had formed close relationships (and others had not). A subsequent analysis of speech samples from teachers who spoke about their relationships with those students revealed teacher-characteristics that facilitated relational closeness despite student-teacher conflict. Our findings have important implications for all teachers. Teachers who experienced close relationships with disruptive students were more likely than other teachers to reflect on the causes of students’ disruptive behaviour and make referrals. Often these teachers attributed disruptive student behaviour to factors beyond the student’s control (e.g. hyperactivity, poor self-regulation, poor eyesight, or family challenges). These teachers were also more likely to refer students to other experts to better understand and respond to disruptive behaviour. Importantly, these teachers often considered how students' home lives might impact classroom behaviour. As a consequence, they reported being more forgiving of disruptive behaviour. Although teachers often need to respond to disruptive behaviour as it occurs, and to quickly diffuse potential conflict, understanding underlying causes of behaviour is important in guiding how teachers react to misbehaviour. When these reactions are carefully regulated, teachers are able to ensure relational closeness endures despite conflict. In our study, the teachers who formed close relationships with disruptive students also demonstrated skills related to emotional competence. They realised and managed their own feelings whilst also considering the emotions of their students, and used this information to guide their interactions with those students. Whilst these skills were evident in our sample of primary school teachers, these same skills may help guide relational closeness with older students too. Importantly, the teachers who demonstrated strong emotional competence with disruptive students were also more likely to express empathy when speaking about those students. In contrast, other teachers were overwhelmed by their negative interactions with disruptive students. 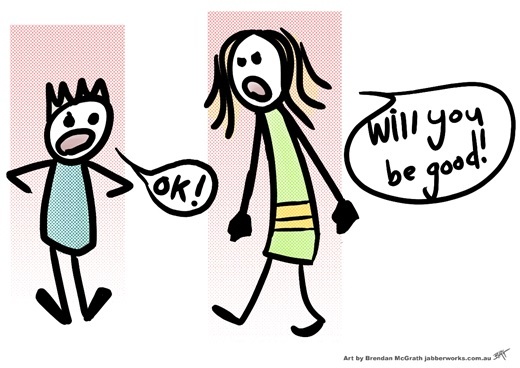 What can we learn from ‘complicated’ relationships? Our findings provide an important point of reflection for all teachers when working with disruptive students. Unfortunately, the disruptive students in our sample who experienced close relationships with their teachers often went on to experience negative relationships with other teachers the following year. In other words, relational closeness was unique to those relationships and did not transfer automatically to other relationships with teachers. Additionally, forming close relationships with disruptive students did not come easily. Building these relationships took time, effort, and persistence, and some teachers found the emotional regulation involved to be exhausting. Notwithstanding the challenges of forming close relationships with disruptive students, the rewards are immense. In addition to reflecting on the underlying causes of misbehaviour and demonstrating strong emotional competence, however, systematic structural support for teachers’ own wellbeing when working with disruptive students is needed. Only when these factors align is it possible for all students to experience close and supportive relationships with teachers. As a classroom teacher, how do you work to form relationships with students with challenging behaviours? Have you found an approach that works particularly well? This research found that building relationships with disruptive students took time, effort, and persistence. In your classroom, how do you manage your own feelings whilst also considering the emotions of your students? I am 82 and taught secondary General Activity children who mostly had disruptive family lives. I started a breakfast program to feed those who missed b’fast. I used bribery- a 5 minute early mark at lunch-time-and I looked for the passion in each child. Years later I taught in the Corrective system and met once more a few of my ex students. They were always polite and warm to me.It has been a privilege to work with the slower students. I volunteer at our local primary school once a week and listen to 7 year olds reading. Thank you Tess. When a new student arrives I immediately search for something positive that makes that student unique. Sometimes it’s hard to find. (It doesn’t have to be academic. Could be their beautiful eyes.) From this point other positive qualities manifest. The relationship is well on its way to be positive. I am so pleased that I chose Teaching as my Vocation.